As a recap from the last post about the N queens problem, we're solving a chess puzzle that asks: how many different configurations are there for placing \(N\) queens on an \(N \times N\) chessboard such that no queen attacks any other queen? This is a popular problem in computer science because solutions often implement recursive backtracking. See the Wikipedia article for details. This solution implements recursive backtracking to explore choices of where to place each queen. It keeps solutions simple, and can be implemented using only primitive built-in data types. Solutions are stringified version of these arrays, consisting of 8 digits, so they are likewise very simple. As a reminder, the Perl solution was originally from Rosetta Code. Here's another link to the Perl solution on Github. The solution requires the use of one array of data that is fixed in size, which for a given column stores a list of rows already occupied by queens, and one array of data that is variable in size, which stores where each queen has been placed. The Python solution makes use of lists by using a fixed-size list for the occupied rows and a variable size list for storing queen locations. It utilizes buit-in methods for the list data type to append and pop, or add and remove items from the end of the list. 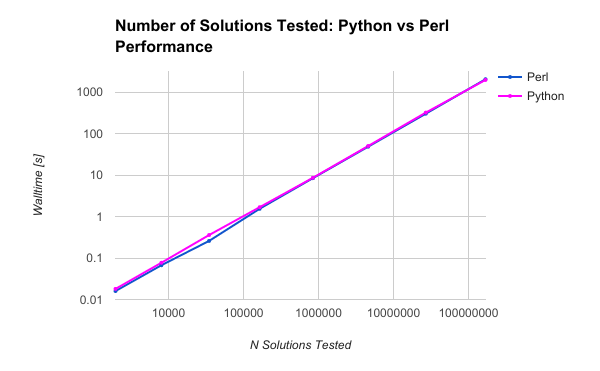 The results of this test show that Python and Perl are fairly closely matched. Results of profiling the Perl code with Devel::NYTProf were detailed in a prior post. 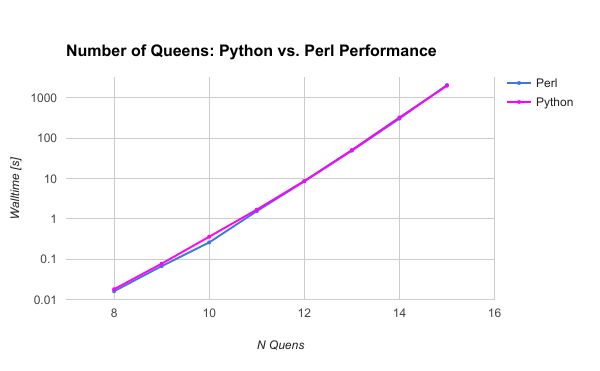 The Python N queens solution was profiled with two tools: cProfile and line_profiler. The line_profiler tool is designed to profile Python code line-by-line, which gives a much more useful breakdown of where the code spent all of its time. It is also helpful because this can be compared one-to-one with the results from Perl, and we can get an equal basis for comparing the two languages. It was not a big surprise to see that Perl and Python were nearly identical in their performance, and it testament to the fact that interpreted scripting languages like Perl and Python operate at one speed, and compiled code in C++ or Java operates at a completely different speed that is an order of magnitude faster (see the comparison of Perl and Java in a prior blog post). Perl and Python were close enough in performance that, although Perl came out ahead on smaller problems and Python came out ahead on the biggest, a different CPU or platform, micro-optimizations, and various butterfly effects could easily turn the tables.